A full year print & digital advertising campaign bundle. Targeting Ibiza residents, businesses & visitors. The bundled price represents a saving of 1706€ on the total price of 3,162€ if all features were purchased separately. Values of features are shown below. Where a feature is not available for separate purchase we have applied a modest nominal value. 1st & 4th paragraph of our news & blog articles. Business editorial article or review. To website, Facebook, or any URL. Businesses looking to reach the following groups. Ibiza workers & seasonal visitors. Ibiza businesses & businesses that trade with or operate in Ibiza. Ibiza tourists & tourism organisations & operators. English speaking ex-pats in Ibiza, the Balearic Islands & Spain. Global audience of those with a connection to or interest in ‘Brand Ibiza’. As the name suggests, this is our package aimed at all year advertising. In most cases we can have the plan up and running within 24 hours of order. The plan duration is a full year / 52 weeks. 28€ a week. 1,456€ for the full year. Pretty good right? There is no catch, we can keep the bundled package cost low. If purchased individually the included features would cost considerably more. 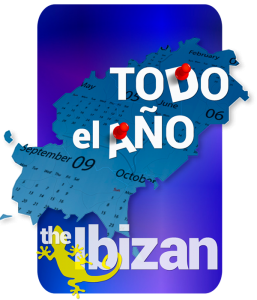 Information on The Ibizan Newspaper now & in its previous incarnation as The Ibiza Sun. The newspaper from 1999 to present. The Ibizan online. Our digital development. Where we are at. Annual report. Hold the front page. Editor’s picks. Other information to be filed everywhere from useful and interesting to useless and frivolous. The numbers game. Key information on the all important figures, our reach & readers. Everything you need for confidence in an effective use of your advertising budget. Everything you didn’t think you need to know about banner adverts. Pros & cons of banner advertising. Essential banner dos & don’ts. Who sees our banner advertising? Measuring the effectiveness of banner adverts. Advanced targeting options, including geo-location & content type. Go back to see more advertising & promotion, proceed to make a booking, or contact us to ask with further questions.